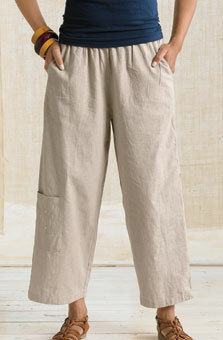 Wrap top in hand-block batik ties for an adjustable fit. Hand embroidery. • Length: PM 30", M 32"
India has the largest number of child brides in the world. Marriages for girls under 18, and sometimes under 15, are arranged by their families for economic and cultural reasons. Many of the artisans were married at a young age, ending their education and often moving them away from their families. These women are now standing up to family and social pressure by insisting that they will keep their daughters in school and out of early marriages. 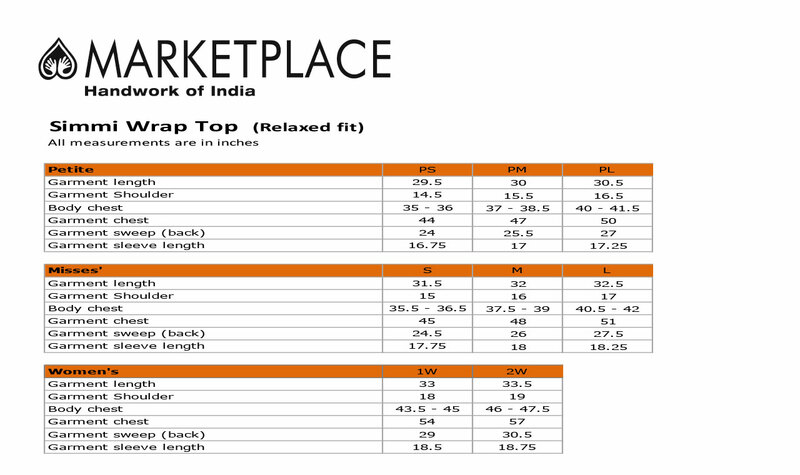 I ordered the Simmi Wrap top in size medium as the fit is described as relaxed. I could barely get it on as it was very small tight through the shoulders. Being 100 percent cotton Im assuming there will be shrinkage. Im returning for larger size as I do like the material print and design of the style. This top checks all the boxes for me! The fit is somewhat adjustable and I think it's very flattering. I like the sleeve length and overall length and the colors and print will be easy to work with.